I promised pictures from the big November event, so here they are! 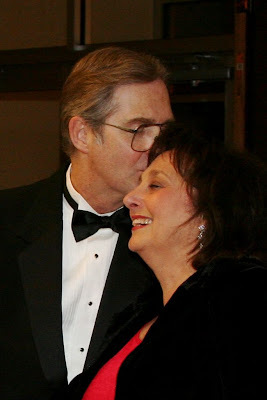 This November my parents celebrated their 40th wedding anniversary. For the past year my sister and I have been planning a grand surprise party to honor them. 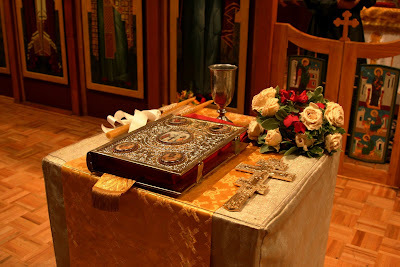 My parents were not married in the Orthodox Church, and many converts choose to have their marriage blessed by the church. My parents had mentioned doing this, but my mom said it was too much to try to plan. We talked with my dad, and decided to surprise mom with not just a party, but a marriage blessing. 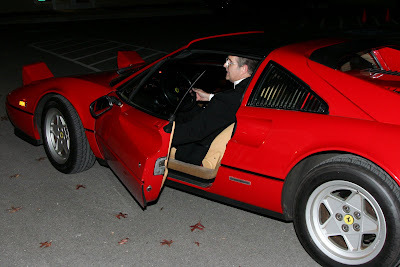 Dad went all out, renting a tux, and one of my closest childhood friends loaned his Ferrari for the ride to the church. A marriage blessing in the church is not very different from the wedding service, so my mom walked down the aisle just like a new bride. 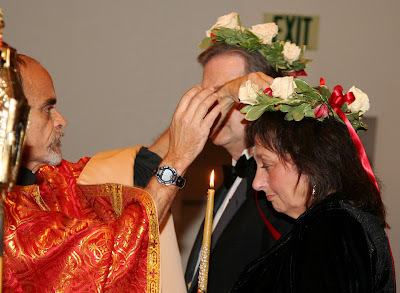 The highlight of the Orthodox marriage - the crowning - the "newlyweds" are given crowns to symbolize their victory in marriage, and their martyrdom to each other. The crowns are joined by a ribbon and are kept as a special reminder of the commitment of marriage. When one of the couple dies, the ribbon is cut and the person is buried with his crown. 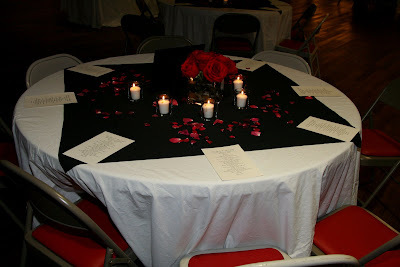 Here is one of the tables - we printed up menus, sewed table overlays, used 120 votive candles, and a 50 cup bag of freeze dried rose petals, not to mention 200 fresh roses, 30 white dendrobium orchids and a dozen white hydrangea. 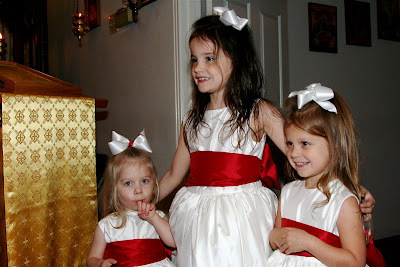 Everything was done in black, red (my mom's favorite color) and white - even the guests all came dressed in coordinating colors. 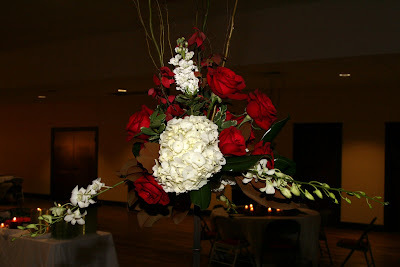 Here is one of the taller table arrangements (they were set on 3 foot high candle stands on the tables). Thank you to Lisa and Brian - I could have never done all the arrangements by myself! 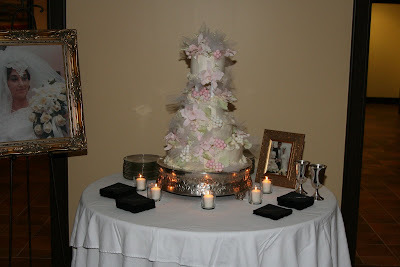 I created a replica of my parents wedding cake - and we displayed my mom's bridal portrait. My Dad's longest friend (see, I almost typed oldest, but I figured he might not appreciate how that sounded :) Mike and Dianne both were in my parent's wedding - my dad and Mike have been friends (and neighbors) since they were 5! 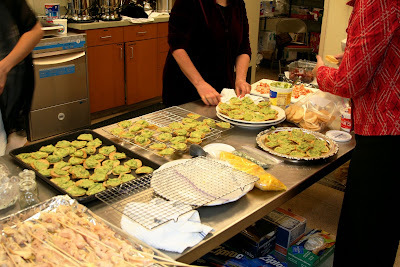 A peek at the kitchen - I had so many wonderful people helping put the food together. My sister and I cooked for 3 days straight, then had a crew help us pull it all together that afternoon. Here are the lobster tacos in progress. 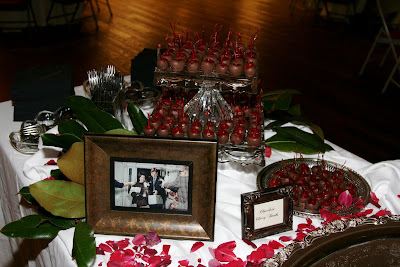 We decorated the central buffet table with magnolia leaves, roses and rose petals - and framed photos from their wedding. The photos were done by Dn. Michael Hyatt, who did a spectacular job. It was such a beautiful evening, and it was so wonderful to be able to do something so very special for my parents. May God grant them Many Years!! What a beautiful night it must have been. Congratulations! That was so sweet of you guys!! Your mother looks like she's blissfully happy. How wonderful! That brought tears to my eyes! I hate that we missed it! 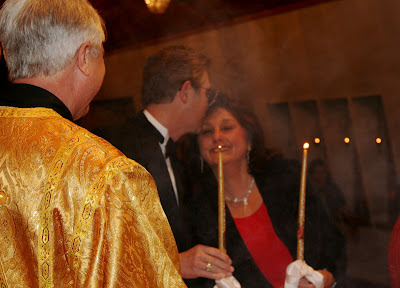 The crowining is my favorite part of an orthodox wedding, too - I'm glad your Mom and Dad finally got to experience that blessing together. What a beautiful tribute! 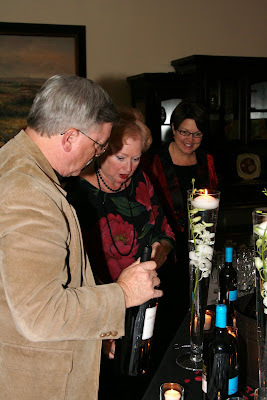 You and your sis did an amazing job - as good as any Beverly Hills event planners ever could! Way to go. I believe we, as God's children, are called to live in a way that reflects His glory. In the same way, it is a great blessing when children reflect the glory of their parents. This wonderful celebration was surely reflected glory back upon faithful and loving parents. We were honored to be part of it. What a beautiful way to honor your parents! I love the tradition of the crowns. This so beautiful on so many levels. Thank-you for sharing!